I usually joke about the difficult life of the accompanying person but this time, no, not even as a joke. Barcelona is just too beautiful. 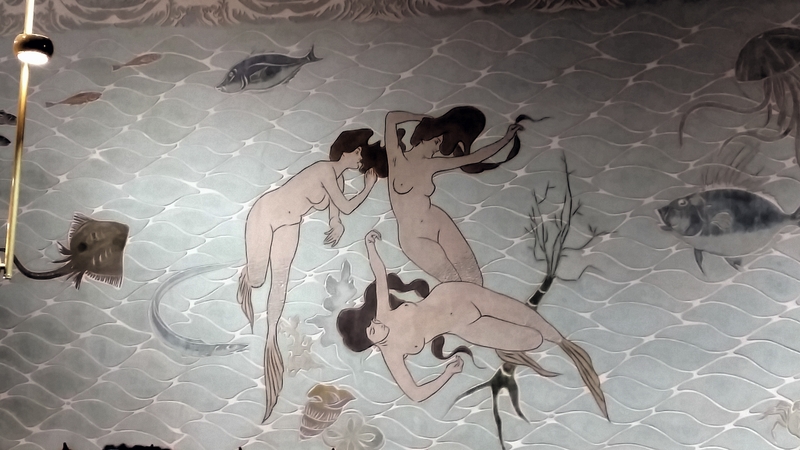 This photo was taken at a reception in a room designed by Montaner, a contemporary of Gaudi. We drank cava, the local sparking wine, and listened to a couple of English lawyers talk about their efforts to ensure that this whole Brexit thing would be nothing more than a slight bump in the road. I wish them luck. 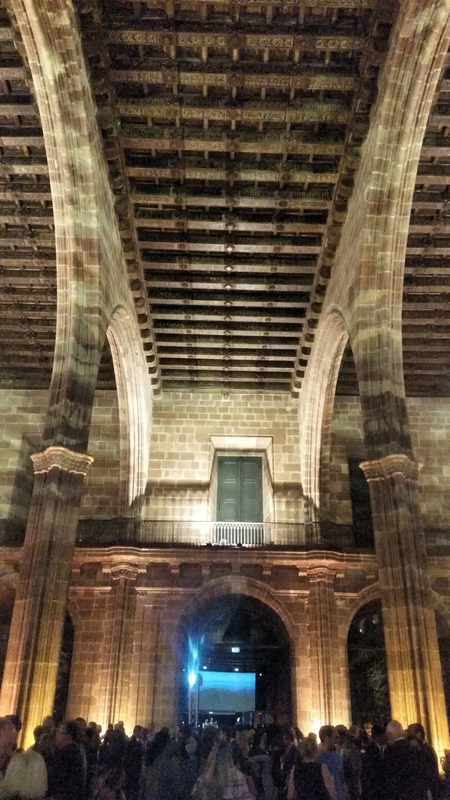 We went to something else at Casa Llotja de Mar. 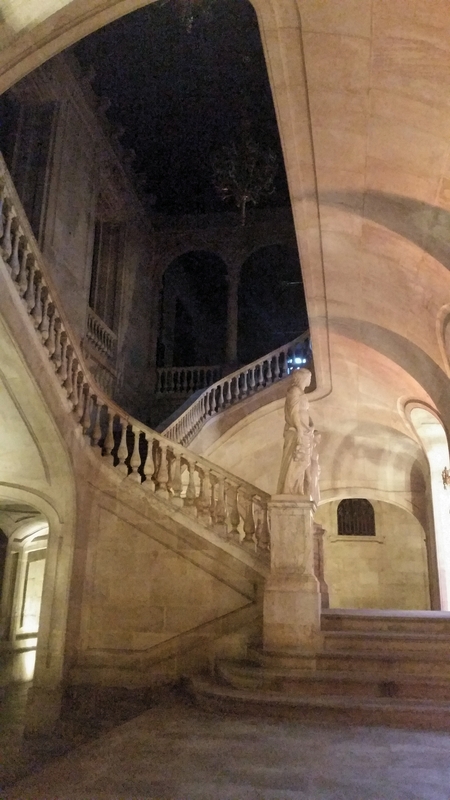 It featured this staircase in the entry courtyard and, just on the other side of the wall, an enormous hall with an oompah band and videos of Bavarian cows. I had a drink or two extra, to tamp down stray thoughts of Kristallknacht. This particular event has no organized accompanying persons tours, for which I am grateful. Traveling around with 50 other people isn’t the best way to see a place. Instead I booked myself into two walks organized by Culinary Backstreets, of which I have taken one, so far. I recommend them. Our Catalan speaking guide took us to all sorts of places I would not have tried on my own, including this place, which has no name that I could find, but where the food was simple and wonderful. I half expected to see Anthony Bourdain at the next table but no, we were the only outsiders, three visitors with a translator. These doors are all over the Born neighborhood. You see a portrait in this style surrounded by lots of graffiti, also in this style. Maybe there is a story behind it. I prefer less self-conscious images, like the one below. 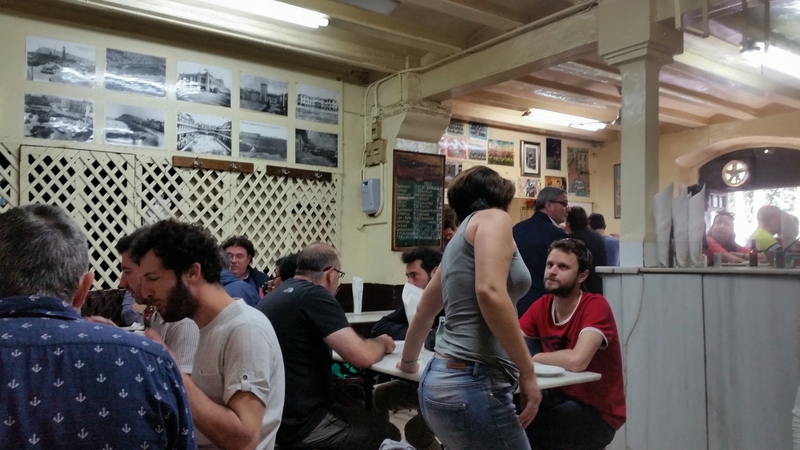 And finally, though it may be no more a secret than Le Grand Vefour, I want to tell you about this quadruple gastronomic delight, lots of food fun, all within about 10 meters on Carrer dels Agullers, a quiet pedestrian street in Born. Vila Viniteca is a wine store that has all kinds of amazing imbibables, at all price points, and a staff that speaks fluent English. 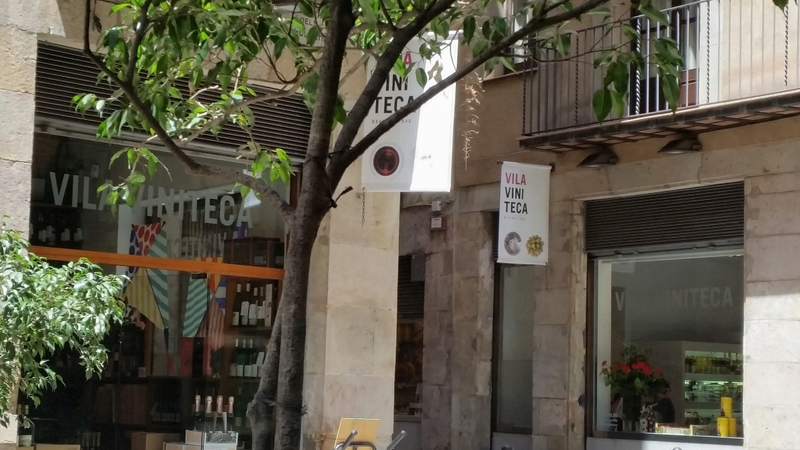 Just across from them is Vila Viniteca food, a grocery with a couple of tables, in case you want a snack. Just across in the other direction, where I sat while taking this picture, is a restaurant favored by locals, Agullers: soup, main, a bottle of wine and two coffees apiece for 35 euros. Breakfast and lunch only, neither web site nor reservations, at least I don’t think so. 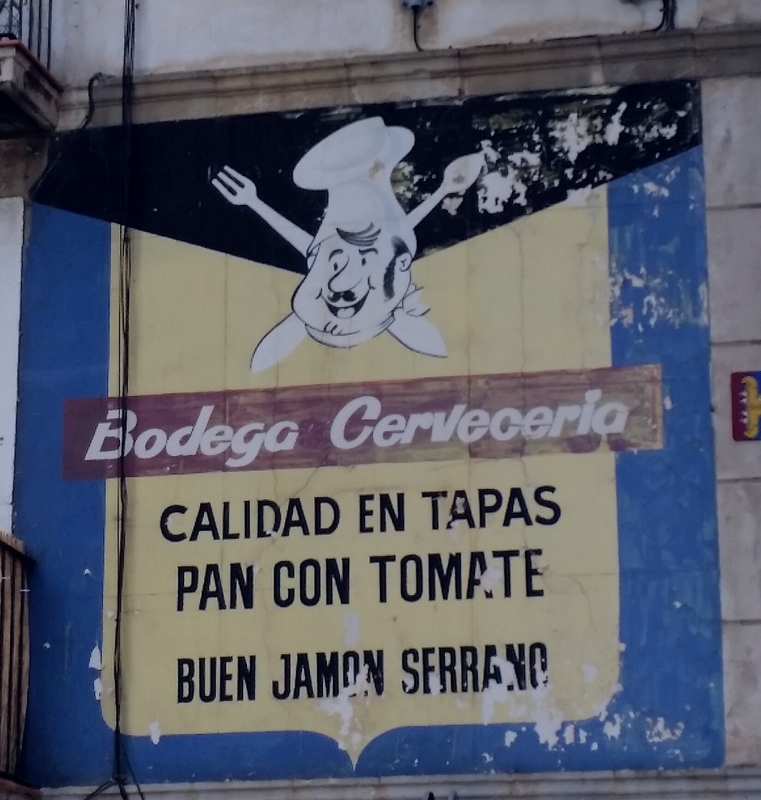 And finally, in the fourth corner, a panaderia — I forget the name — that makes this incredible spongy bread that is perfect for soaking up drizzled olive oil and crushed tomatoes. It’s all good. Makes me want to head back to Spain…..
It’s beautiful and the weather is perfect. Barcelona is getting expensive but still nothing like Paris. I chose to move to France but every time I come here I am reminded why Barcelona was a close second choice. Loved the photos! You have such a great eye! Jealous making. Really jealous making!